I'm pretty sure that 75% of the Jalopnik readership is composed of warlords, dictators (deposed and serving), and various other fiercely important players in highly dangerous environments. I know I am. That's why I'm proud to present the global introduction of INKAS' new armored personnel carrier, the Huron. Huron is a unique APC in terms of technical specifications, design and assembly. The vehicle is characterized by a high level of maneuverability and is extremely lightweight relative to its size. It incorporates revolutionary lightweight armor which increases its mobility and speed performance in comparison with the other similarly-sized vehicles in the market. Huron's well-proven off-road capabilities are supported by an 8.3L Paccar Engine and a ten-speed manual Allison Transmission. 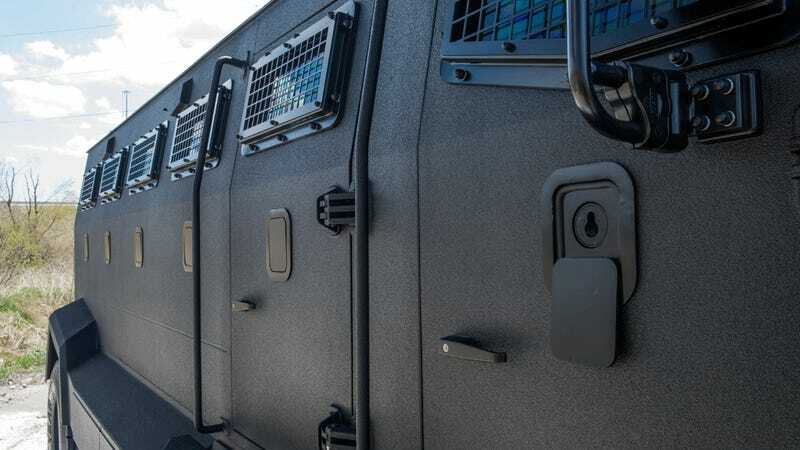 The OEM body of the vehicle was replaced with a fully re-designed body by INKAS® Armored Vehicle Manufacturing that incorporates heat and noise insulation materials providing an unprecedented level of comfort to its occupants. Huron's perimeter armoring of the passenger compartment and engine bay is designed to provide protection against 7.62x51 SC ammunition, 7.62x51 M80 NATO Ball ammunition and tested to meet NIJ- STD-0108.01 Level III / CEN Level B6 ballistic standards. The floor is fitted with blast protection to defend occupants against fragmentation from detonation of 2 DM-51 German ordnance hand grenades or equivalent light anti-personnel mines. Hopefully, this gives you the information you need for your next armored personnel carrier purchase. Based on the pictures, the Huron does look pretty tough, and has what may be the most well-protected turn indicators in the history of motoring. That, or the most dangerous indicators that have to be kept in stout cages or they'll go right for your neck. Up top appears to be a full surveillance/sensor suite, complete with a steerable camera with an adorable tiny wiper for the lens. The interior does have a bit of an imprisioned feel, but I suspect that's hard to avoid in a vehicle like this. There's something strangely appealing about a vehicle like this — the inside is such a protective little cocoon, and you can just imagine the sorts of adventures or situations you might be in inside one of these. Maybe appealing's not the right word. Somewhere between exciting and terrifying. The first deliveries of these will be four to the National Police of Colombia, so if you're a Colombian on the wrong side of the law, now's a good time to start memorizing the light pattern of this beast. If you recognize it, I'd suggest running. Also, this thing kind of looks like the bus you'd take to the apocalypse.